The information in this guide will help you create properly formatted bibliographies, work cited lists, footnotes, and in-text notes for most research projects undertaken at Dickinson. If the style you need is not listed, please contact a librarian for help. An annotated bibliography is a list of citations to books, articles, and other materials that also includes a short statement about the work's value. Click on a link below to learn how to write an annotated bibliography according to the appropriate style for your class. Also check out the Writing Center's YouTube video How to Write an Annotated Bibliography. 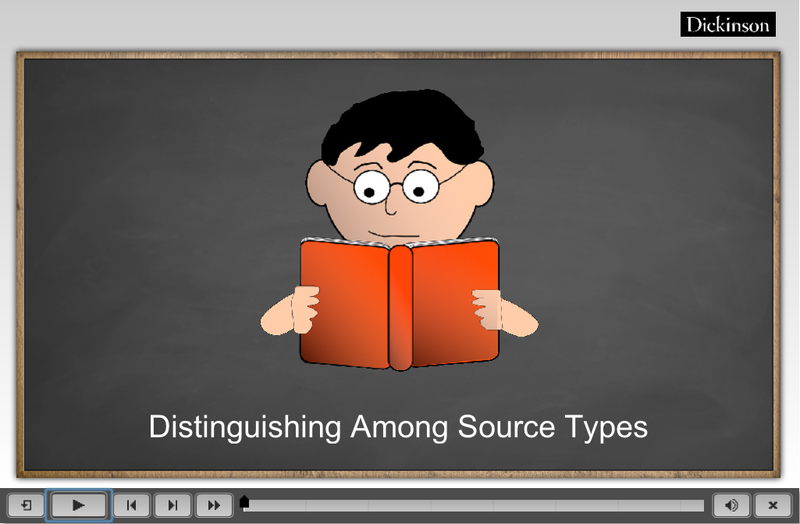 Distinguishing Among Source Types by Dickinson College is licensed under a Creative Commons Attribution-NonCommercial-ShareAlike 4.0 International License. What is the Purpose of Writing a Bibliography? Taking other people's ideas and presenting them as your own is a violation of college policy. When you are writing a research paper, you must tell your readers which ideas were not your own. A bibliography will help you do this. Positively, compiling a bibliography will help you learn about your topic, discover the experts and important writings in your field, and will direct your readers who want to learn more about your topic to other resources. The act of forming a bibliography will also help to familiarize you with keywords you can use to conduct more extensive searches, and will help you to form your own original opinions about the subject. A bibliography is a list of citations made up of all the sources you consulted in preparation for writing a research paper. Even if you do not directly quote an item in your research paper, you should still cite it in your bibliography if you used it to gain knowledge you did not previously have. Each citation in the bibliography is a description of the essential elements of each work consulted. This includes, but is not limited to, the title, author, publisher, and date of publication of each work. Citations are constructed using strict rules regarding punctuation, text format, and paragraph indentation. Each citation style (Chicago , APA , ASA , GSA and MLA) has different rules. The bibliography in a typical research paper is presented in alphabetical order by the the first item listed (usually the author). To plagiarize is to use without proper citation or acknowledgment the words, ideas, or work of another. Whenever one relies on someone else for phraseology, even for only two or three words, one must acknowledge indebtedness by using quotation marks and giving the source, either in the text or in a footnote. For more information from the Writing Center about how NOT to plagiarize, see Professor Lape's short presentation, How Not to Plagiarize. Additionally, read our guide on Academic Integrity and How to Avoid Plagiarism. RefWorks is a Bibliographic Management Tool to which Dickinson College subscribes. Please visit the RefWorks Guide for information about what RefWorks is and how to use it. Click here to access the Legacy version of RefWorks.